By today’s appearance, it’s easy to overlook the bridge at Bornholmer Strasse (also known as Bösebrücke) as an historic landmark. On the night of 9 November 1989, the Berlin Wall opened here first, at the Bornholmer Strasse bridge border-crossing between East Berlin and West Berlin. The city of Berlin was divided in two between 1961 and 1989 with a physical wall as the physical manifestation of East German (GDR/DDR) policy. Bornholmer Strasse was the northernmost of the seven road border-crossings between West and East Berlin. Only citizens of West Berlin and West Germany (FRG/BRD) could enter East Berlin at this crossing, whereas citizens of East Berlin and East Germany were forbidden from using the crossing into West Berlin. On 9 November 1989, the East German government announced new travel regulations which were incorrectly stated at a news conference. But once word had gotten out East Berliners could travel “freely” across the “open border” into West Berlin without the onerous process of a travel visa, people gathered at various border crossings, including Bornholmer Strasse at around 8pm. Border guards began letting pedestrians and cars trickle across the border by 930pm. Guards at other road crossings also began letting people through. But hundreds gathered became thousands, and when it became clear no additional support was forthcoming to manage “control” of the border, border guards decided on their own initiative to open the gates wide open at around 1130pm to relieve mounting pressure and appease those who openly demanded free passage. Just after midnight, 20-thousand people had already crossed the Bornholmer Strasse bridge and the inner-German/intra-Berlin border. The Wall was effectively finished without a shot fired that night. 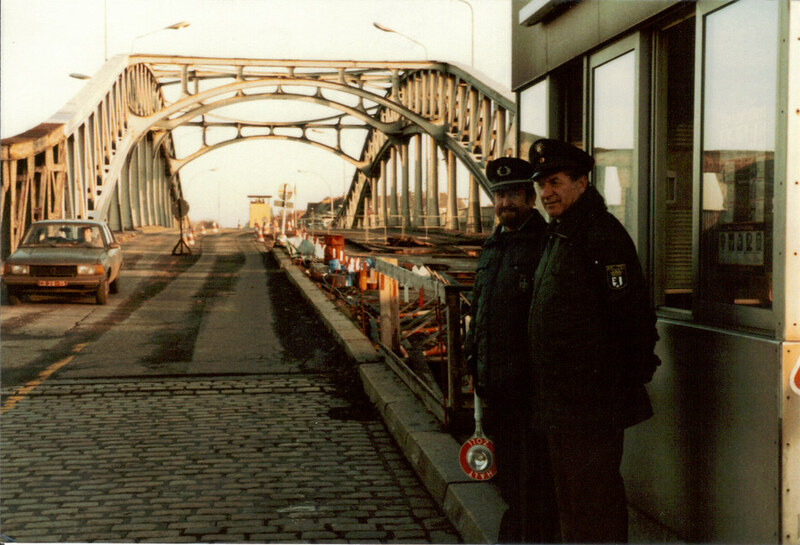 All border controls ceased on 1 July 1990 (day of monetary union), and checkpoints were no longer manned on 3 October 1990 (German Reunification Day). With its inauguration on 1 October 1935, the Bornholmer Strasse station saw S-Bahn train service from central Berlin north to the outlying towns of Bernau, Oranienburg, and Velten (e.g., 1936). S-Bahn service resumed with reconstruction after the Second World War (e.g., 1951). Because of its proximity to the East-West Berlin border and subsequent construction of the Berlin Wall, Bornholmer Strasse station closed on 13 August 1961, becoming a Geisterbahnhof or “ghost station”. West Berlin’s S-Bahn trains sped through the station without stopping, whereas East German trains traveled on new tracks from late-1961 along the so-called “Ulbricht curve” between barriers near the “ghost station”; see images below. The station reopened 22 December 1990 for West Berlin trains, and a second platform opened the following August to allow train interchange. Today, Bornholmer Strasse station is served by trains on S-Bahn Berlin routes S1, S2, S25, S26, S8, and S85; additional side branches of the S-Bahn Ringbahn from both Gesundbrunnen and Schönhauser Allee stations go to Pankow via Bornholmer Strasse. Berlin Wall and border crossings, by SansCulotte on Wikipedia (CC2). The location of the border crossing between West- and East-Berlin at Bornholmer Strasse/Bosebrücke is indicated by a red rectangle. Only West Berliners and citizens of West Germany were allowed to enter into East Berlin at this crossing. The filled red circle indicates the present-day location of the Platz des 9. November 1989 memorial at the northeast corner of Bornholmer Strasse bridge. The train station closed after 1961, becoming a “ghost station” (labeled ‘G’). Note the wall (labeled ‘W’) separating West and East Berlin, the absence of vehicular traffic near or around the bridge (labeled ‘B’), and secondary walls and physical obstructions at the border crossing (Grenzübergangsstelle, GÜSt) and bridge from the east side. The overhead image was likely taken by East Berlin/East German security personnel on border patrol. Picture likely from 1980s on an information pillar at the memorial; you can compare the above with similar pictures from the Stasi Mediathek. Berlin ghost stationsm as grey “no entry” symbols. West-Berlin routes for U-Bahn U6 and U8 and S-Bahn S2 went through East Berlin; trains did not stop at stations inside East Berlin with junction station Friedrichstrasse as the key exception. Bornholmer Strasse station is identified as an open red rectangle. Source: Wikimedia. West Berlin BVG transport map, dated April 1989, 7 months before the fall of the Wall. Just like Bornholmer Strasse station (labeled with an open red rectangle), “ghost stations” are represented as open squares. Source: berliner-verkehr.de. Facing north, divided tracks towards Bornholmer Strasse station (left-centre) and bridge. Photo made in 1990 after the fall of the Wall (Wikipedia CC3). • Former border crossing at Bornholmer Strasse (berlin.de): English – German. • Damals-Heute (then and now) picture comparison, Chronik der Mauer, in German. • Die Nacht, in der die Mauer fiel (The night the Wall fell), 30-minute YouTube video in German. • “Bornholmer Strasse”, 88-minute movie in German about the border guards on the night the Wall fell. • Kreuzberged provides a concise history of the Bornholmer Strasse bridge (in English). I made the above pictures labeled “HL” on 8 May 2015. This post appears on Fotoeins Fotografie at fotoeins.com as http://wp.me/p1BIdT-ajU. Revised 9 Nov 2018 for S-Bahn routes through the train station. Neal, thanks for your comment and for stopping by!